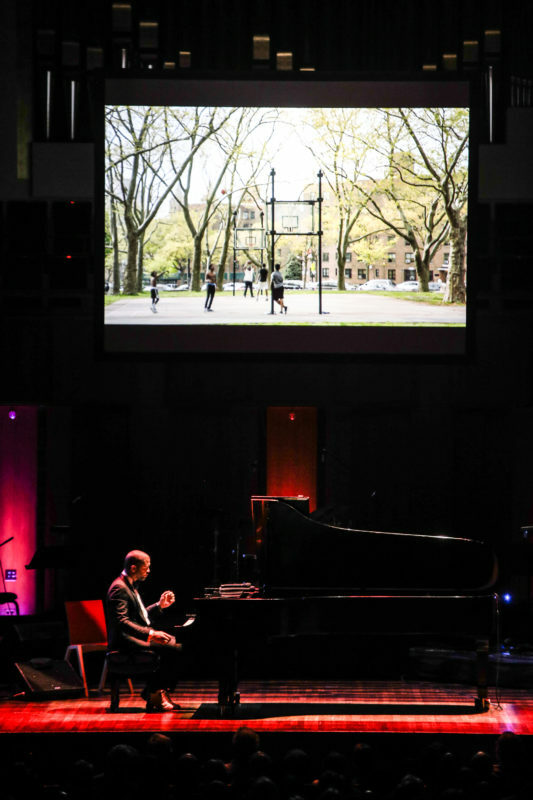 Jason Moran’s approach to the role of artistic director for jazz at the Kennedy Center has been suspiciously similar to his approach to the role of pianist, composer and bandleader: to mediate a dialogue between the music’s history and its cutting-edge present. That has often meant bringing in the elder statesmen along with the rising young players, or exploratory projects like Moran’s own Fats Waller Dance Party. But it also means putting multiple generations onstage together in celebration of jazz immortals. In October, that meant two centennial celebrations—for Thelonious Monk and Dizzy Gillespie—in a two-week span. Moran was an active participant in the October 8 Monk centennial, clearly the more personal of the two for him. “Can we all rise and have another round of applause for the supreme being, Thelonious Monk?” he asked the audience in the Concert Hall, after its ovation for his entrance had died down. Overhead was projected a picture of 16-year-old Moran in a Monk t-shirt, with Monk album covers plastered to his wall. 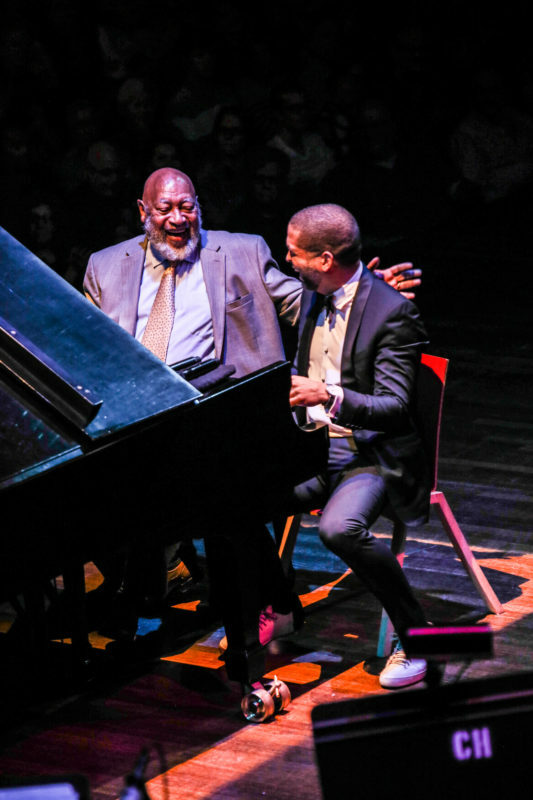 The concert had initially intended to include a three-way piano conversation between Moran, Kenny Barron and Geri Allen. Allen’s sudden death in June left only Moran and Barron for the evening’s first half. Instead of the three-way, they took turns giving solo performances: Moran on “Bemsha Swing,” injecting his own distinctive harmonies; Barron on “Light Blue” and “Well, You Needn’t,” throwing in Monk’s abrupt flavor of accents, yet still improvising too fast and fluid to mistake for anyone but Kenny Barron. Moran returned to play accompanist’s renditions of “Evidence” and “I Mean You,” as jazz veteran Bob Northern (aka “Brother Ah”) reminisced about knowing the young Monk in New York. Finally, both pianists came together for a delightful performance of “Monk’s Blues,” switching sides of the piano bench mid-song without missing a beat. 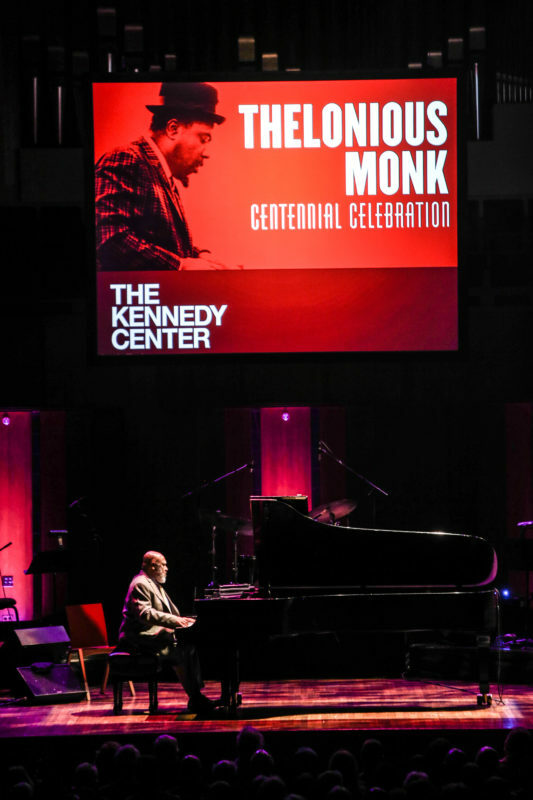 Tellingly, neither pianist used sheet music at any point—they knew Monk’s songs inside out. A second set comprised an excerpt from “In My Mind,” Moran’s octet re-imagining of Monk’s 1959 Town Hall concert. (The excerpt essentially went for the track lineup of the original LP, as opposed to the full concert he usually performs). There were extraordinary moments in the remarkably contemporary-sounding set—in particular, a powerful solo by trombonist Kuumba Frank Lacy on “Monk’s Mood,” a haunting one by alto saxophonist Immanuel Wilkins on “Crepuscule with Nellie” and Moran’s brilliant slow drag of “Off Minor.” The first set, however, was where both the thrills and the charm were concentrated. Then came Dizzy’s friends. The band (save Chestnut, Lee and drummer Tommy Campbell) left the stage and Heath returned to perform “Round Midnight” on soprano, taking up his tenor for the final head. Trombonist Steve Davis and trumpeter Jimmy Owens then joined in for a bossa-nova take on “Algo Bueno,” Heath dancing in place as they soloed. After a beautiful short set of (further) bossa tunes by another small-band configuration—Cassity and Hendrix joining Lee, Campbell and Brazilian pianist Abelita Mateus—another longtime friend of Dizzy’s, Cuban-born clarinetist Paquito D’Rivera, joined in for “Tin Tin Deo.” His arrival was a turning point for the show, since D’Rivera is both (arguably) an even bigger ham than Gillespie, and unable to resist stealing the spotlight. He did four fully developed tunes, sharing the lead with Roditi on two of them but allowing no other soloists, even though the big band had returned. By the time of the evening-ending ensemble medley of “Manteca” and “Night in Tunisia,” two and a half hours had passed. The audience was ecstatic; this writer, exhausted and somewhat bemused. Still, no one can say that Gillespie got short shrift on his 100th birthday, even if no moments quite equaled Moran and Barron’s piano summit at the magnificent Monk spectacular. 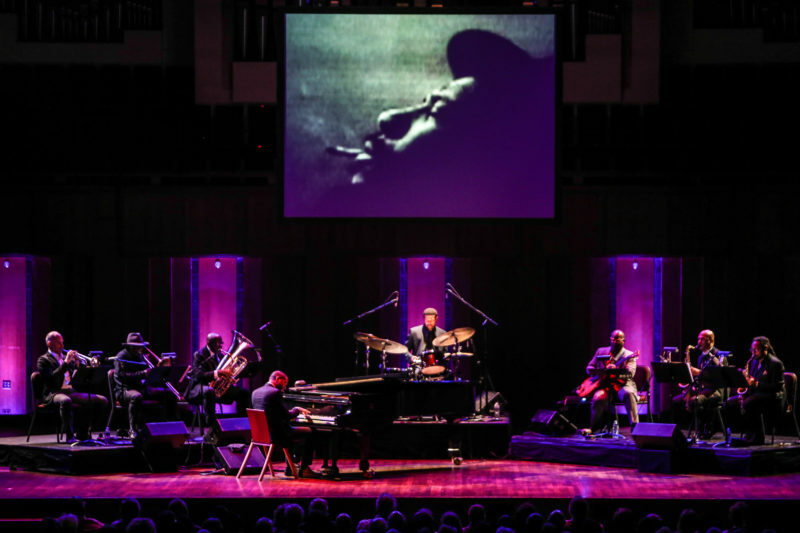 2017 is a banner year for the legacy of jazz, and the Kennedy Center—and Moran—unquestionably know how to mark it.